So you better stock up on that caffeine! “Despite my misgivings about the constitutionality of this one provision, I have signed the bill. I have directed the Attorney General to cooperate fully in expediting a swift court test of the constitutionality of the 18-year-old provision.” And with the stroke of his pen, the executive authority of President Richard Nixon effectively lowered the voting age for all citizens in federal elections to 18 (also for state and local elections, but this was soon refuted in part by the Supreme Court). This extension of the Voting Rights Act came about in 1970, when increasing pressure from those conscripted to fight in the Vietnam War were outraged that they had no representation in the same government which could send them off to fight. Shortly thereafter, the youth culture of America continued to pressure its government to be more inclusive to its younger citizenry. Thus, in 1973, another Constitutional amendment was passed which allowed anyone above the age of 18 to run for state or federal office, such as the U.S. House of Representatives and U.S. Senate. But before you check your history books, rue believers, wondering how you could’ve missed all that in your U.S. Constitution class, I humbly ask that you take my word for it. After all, how else could we have voted into the White House the very first teenage president whom we all revere so much today? President Prez Rickard came from meager beginnings, as have many of our greatest leaders. In his quaint hometown of Steadfast, Middle America, 18 year-old Prez took the liberty to personally repair all of the clocks throughout the town, which were all out of sync and continuously chiming. It was these clock-syncing skills which earned him the notice of businessman Boss Smiley, who backed Prez’s candidacy for the U.S. Senate. After discovering the illegal activities of Smiley, Prez broke out on his own and won the election after training both his body and mind with the help of a local Native American dissident named Eagle Free. These skills of tracking like a fox, hunting like a hawk, grappling like a bear and other talents would come in handy during Prez’s political career. Shortly after his Senate victory, Prez broke the glass ceiling and became our very first teenage U.S. President! Prez nominated Eagle Free as director of the FBI and collaborated with all the newly elected teenage congressmen and congresswomen to usher in the greatest era of peace and prosperity this nation has ever known! Early in his presidency, Prez faced one of the most dire threats to democracy in the history of this great country, the Washington Minutemen! They began with what appeared to be a simple demonstration — dozens of men marching to the White House clothed in costumes seemingly from the Revolutionary War. However, things turned almost deadly serious when the crowd of demonstrators parted to reveal an old-fashioned cannon and fired it directly at the White House! Fortunately, instead of explosives, the shell contained a “dwarf”, or little person, who emerged inside the White House none the worse for wear. With a harsh fist-waving admonishment “You can’t do that! This is the White House!”, the mob was allowed to disperse. The intruder, named “Baron von Stomp” was a member of the Washington Minutemen. They were attempting to convey their disapproval of a congressional bill which would outlaw the sale and possession of firearms, and shooting a four-foot bullet into the White House was how they chose to express their point. The Washington Minutemen were – as told to Prez by FBI Director Eagle Free – an extreme right-wing organization whose members had been storing hordes of arms all over the country. Yet somehow, Eagle Free’s agents had infiltrated their ranks and had detailed files on all the Minutemen’s members, including many sympathizers within the halls of Congress. Apparently, congressional blockades stalled this gun control bill for quite a while because – before we knew it – it was the middle of December, the bill still hadn’t become law, and the Minutemen were freezing and starving in the dead of winter. They had a camp near Philadelphia, where General George Washington and his men camped during the Revolutionary War. Their leader, Gregor Washington, was George Washington’s great-great-grandnephew (although Wikipedia disputes this, saying Gregor was the great-great-great-great-great-grandnephew of our first president). He seemed rather obsessed with acting out this new revolution in the same way his ancestor did: soldiers in tents, muskets, horse-drawn carts, and he even sported wooden teeth as George Washington himself was rumored to have done. With his authentically ancient practices as an 18th century revolutionary, Gregor’s men were on the verge of starvation. Many had no shoes or coats to weather the snow, food was scarce, and the soldier’s pay consisted of badly counterfeited bills which would not be accepted elsewhere. Even Gregor’s wooden teeth were a problem as his dentist could not mold them, but had to whittle them each time the old ones broke apart. What made “Valley Forgery” beneath the government’s notice was mainly that they had exhausted their supply of ammunition and posed no threat in such a shabby state. Cold months continued to go by and all seemed well in Washington, D.C., and Prez was poised to sign the new gun control bill into law the next morning. That is, until a sniper’s bullet sailed through the window of the Oval Office! The following bulletin read throughout all the papers in the country: “On February 18th, at exactly midnight, one shot was fired into the president’s office. 20 minutes later an ambulance was seen leaving the White House. Security guards moved in to double-up on an all-night vigil…” Citizens throughout the country held their heads low and worried endlessly on the fate of President Rickard. They prayed in churches, schools and homes, and wondered if Prez was alive and what his condition might be. While the government was in chaos, Valley Forgery caught its first break. A secret member of their revolution and employee of the U.S. Treasury, Imperiale, brought his new invention to Gregor’s tent. It was an innovative printing press to easily, quickly and cheaply produce counterfeit money, completely indistinguishable from the Treasury’s own bills. With food, clothing and ammunition now available in plenty, the Washington Minutemen gathered their strength and then paddled their little boats (just like the ones George Washington used) to cross the Delaware River and head straight for the White House! Recovered from his gunshot wound, Prez hid from the press in a teepee with Eagle Free and his closest advisors at Eagle Free’s Nature Nation community. The military generals advised him to take action against the insurgents, especially after the Minutemen captured General Patting of the National Guard. Prez, however, was steadfast in his oath that “no American blood will be spilled on the streets of the nation’s capital!”. With the armed forces led by Gregor Washington advancing, however, the time had come to make a decision. Eagle Free drove a jeep waving a white flag to the oncoming army and requested a “powwow with the great chief of the Minutemen”. Instead of open war in the streets of Washington, D.C., Prez challenged Gregor to hand-to-hand combat, a duel to determine the victor and fate of the United States. Gregor accepted the challenge, but once Eagle Free left the meeting, he began to plot Prez’s downfall. They would dress up Sgt. Hood, a hulking man well-versed in Karate, as Gregor, who would then pretend to be Prez’s opponent . When asked by Hood how far he should go in the fight, Gregor replied “All the way, Hood. Kill him!”. The showdown turned fierce quickly, and although Prez could immediately tell that his rival was not Gregor, Eagle Free urged him to fulfill the terms of the truce and engage his man-mountain opponent (lest he appear to be “yellow”). A revolutionary-style drummerboy set the tone for a tense battle and the two combatants locked horns in an ultra-high-stakes brawl! The larger man immediately took the advantage, beating upon Prez with all the power and skill at his disposal. A four-star general stood near the battle and, seeing Prez on the verge of defeat, pondered “This is impossible! Shall we send the troops to the attack?”… to which Eagle Free responded “Does the white man break his word again?” (*author’s note: Aw snap, burnnnnn!) Despite being pummeled mercilessly, Prez summoned the strength from his “Indian fighting” to catch Hood off-guard, put him on his back, and prepared the killing blow. Eagle Free quickly intervened, however, despite the military’s shouts to “finish him!” and “kill him!”. With some difficulty, Eagle Free helped Prez regain his composure, saving Hood’s life and earning his complete victory in front of all onlookers. The Washington Minutemen were not yet ready to concede, however, as they immediately broke the truce and charged the armed forces of the U.S. National Guard. Our nation’s fighting men were caught unprepared and without orders, mustering up whatever they could to defend themselves against an enemy who was out for blood. It was only then that Prez reached his breaking point. With a tear in his eye and a heavy heart, President Rickard gave the order: “Call out your forces, General! Smash them!”. The overwhelming power of guns, tanks and overhead jets trounced the Minutemen in a heartbeat, but Prez could not permit wanton slaughter of an inferior force. He ordered the cease of hostilities before all of Gregor’s men were killed, stepping in between the opposing forces on the battlefield and ordering everyone to stand down. It was then that Gregor saw his final chance and in the bustle and confusion lassoed the president around his neck and proceeded to drag him away from the field of battle. The kidnapping was short-lived, however, as Sgt. Hood emerged from the fray and tackled the rider who was dragging Prez by his neck, saving Prez from being held for ransom… or worse! After some simple explanation, it turnout out that Hood was one of the FBI infiltrators, part of a plan to foil Gregor’s revolution at just the right moment. With the battle concluded, the Washington Minutemen surrendered and left Prez with a great deal to ponder. The following day, Prez addressed the combined houses of congress with the following speech (transcript excerpt): “…this day I have passed from a callow youth to a mature man. I have learned from this tragedy that force cannot be met with cool phrases, love, or flowers … and now, we must bind up the nation’s wounds, with malice toward none, and charity for all.” His speech was praised by the older, more experienced members of congress while he was branded as a “warmonger”, “traitor” and “hawk” by his younger peers. In the end, it was an important victory and lesson for both the president and American people. Prez would go on to sign many laws during his two terms which reduced poverty and hunger, improving employment and racial equality, and promoting a general sense of peace and generosity among the world-at-large. 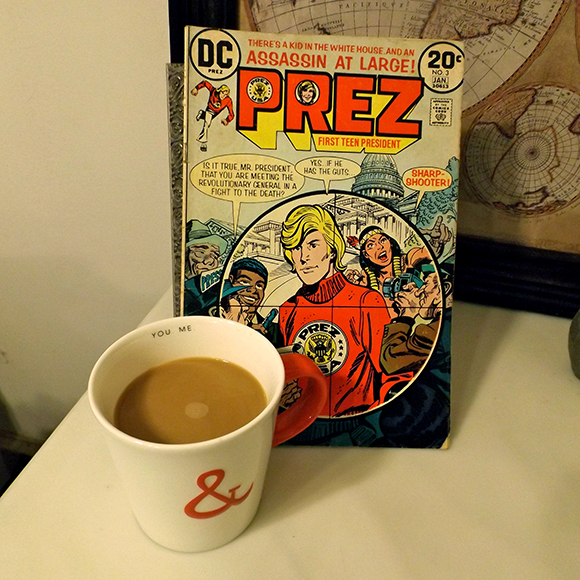 DC Comics published four issues of Prez, First Teen President around the same time as Prez’s first term in office. They infused these comic books with an extremely balanced amount of adventure and bureaucracy, political ideals and humor, serious problems and general silliness. Prez Rickard may not have been a super-hero in DC Comics, but he exercised his executive authority and power of veto (not to mention his hand-to-hand combat skills) to protect our nation and preserve the Constitution. If you, dear readers, ever consider running for office, I suggest using Prez Rickard as the finest of role models, that you stock up on plenty of coffee for those political fundraisers, and to always Fare Thee Well! Prez, First Teen President #3 is written by Joe Simon and illustrated by Jerry Grandenetti (both interiors and cover art). Today’s column title adapted from “Teenagers” by My Chemical Romance with great respect and appreciation.